Patrice Bergeron, Tuukka Rask and the rest of the Black and Gold made sure on Thursday night not to allow their previously intact 12-game winning streak to flip into a two-game losing streak. 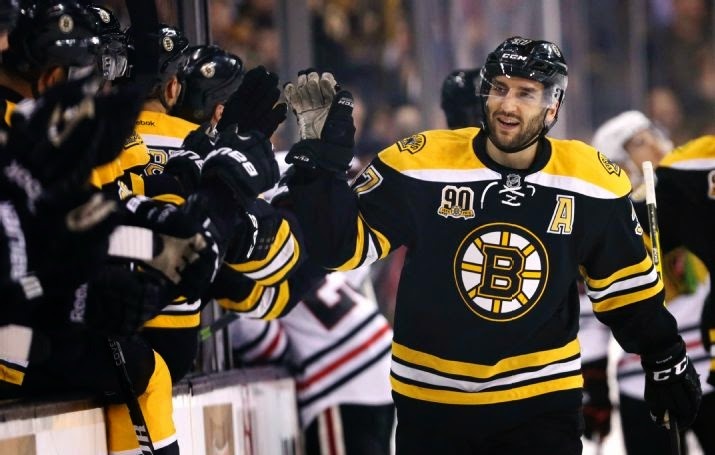 Bergeron scored twice, Carl Soderberg added the other, and Rask made 28 saves for his league-leading 7th shutout of the year as the Bruins got back on the winning track in beating the Chicago Blackhawks 3-0 for their 50th win of the season. In the first game back in TD Garden for these two teams since Game 6 last year in the Stanley Cup Final, emotions were expected to be at an elevated level for players, coaches and fans on both sides. Memories of heartbreak, sorrow and sadness for one; joy, triumph and elation for the other. But for tonight, the result turned out in Boston's favor, as the Bruins stifled the Blackhawks for 60 minutes and moved one step closer to clinching the Atlantic Division and home-ice advantage throughout the Eastern Conference playoffs. The Blackhawks came out of the gate flying, outshooting the Bruins 6-1 through the first six minutes of play. But the Bruins evened out of play through the remaining 10 minutes of the period and capitalized on their efforts. It was Patrice Bergeron who opened the scoring for the home team at 11:50 of the first. Bergeron deflected home his 24th of the year off a Matt Bartkowski slapshot from the blueline. Bergeron got inside position on Blackhawks D-man Duncan Keith in front of the net and got the stick in the right spot to deflect the puck past Corey Crawford's glove. The Bruins held the lead for the rest of the period and through the second frame, as both teams traded multiple chances but couldn't find the back of the net. Chicago outshot Boston 9-6 in the second period but couldn't breakthrough against Rask. The Bruins and the third line made it 2-0 five minutes into the third when Carl Soderberg smashed home a loose puck in the slot that beat Crawford again on the glove side. Soderberg entered the zone and drew four Hawks players, allowing Chris Kelly to jump to the puck in the corner after it was swept off Soderberg's stick. Kelly passed over to Johnny Boychuck at the blueline, and his shot hit a few bodies in front and rested right in the path of the oncoming Soderberg, who rifled it home for his 14th of the year. Some controversy surrounded the Bruins' third goal, which came just 13 seconds after Soderberg's tally. Directly off the face-off from the previous goal, the puck was worked into the zone by Boston and played behind the net by Crawford. Crawford tried to play the puck behind him to Niklas Hjalmarsson, but Brad Marchand jumped the play and stole it off his stick. Marchand's pass hit Bergeron in the face-off circle who fired it on net, but the net was hit off its moorings. After the refs got together and reviewed the play, the replay showed Crawford shoving the net when he realized he couldn't get back into the crease to save the shot. He clearly did it on purpose in a desperation attempt, but it was all for naught as the refs made the right call and gave Bergeron the credit for his second goal of the night and his 25th on the year. The Bruins wound the rest of the game down, leaving the Hawks with few premium chances to get back into the game in the last 15 minutes. After losing on Monday vs Montreal and having their 12-game winning streak snapped, the Bruins wasted no time in getting back in the W column. The Bruins now have 106 points on the year and move back into first place overall in the NHL. St. Louis has 105 points. With Pittsburgh's 3-2 loss to the Los Angeles Kings, Boston is now 9 points ahead of Pittsburgh, and barring any catastrophic incidents in their last 9 nine games of the year, it looks like the Eastern Conference playoffs will go through the Garden. The Bruins have Friday off before hitting the road to play a weekend double versus the Capitals on Saturday and the Flyers on Sunday. Puck drop for both games is just after 12:30.